Marvel movie fans don't have anything on Marvel comics fans. Aficionados of superhero cinema have only really been paying attention since 2008's Iron Man, but these live-action versions are just a screen-friendly shadow of their ink-and-paper origins, with movie costumes that don't always do their originals justice. Our design team collaborated with cosplay photographers to highlight some of the major ways in which the MCU's Avengers differ from their comics counterparts and illustrate how they'd look if they stayed true to the comics—along with some of the ways they're right on the money. If there's one on-screen Avenger who looks significantly different from his comic counterpart, it's Hawkeye. For the big screen, Clint Barton dropped his garish pointy mask and uniform for a more tactical look. 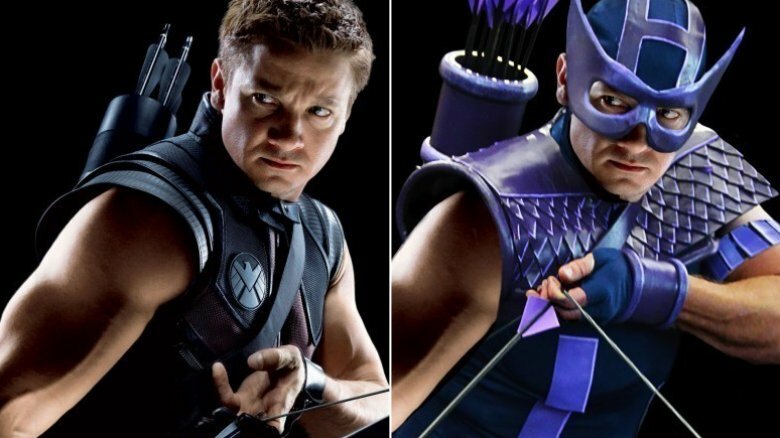 The two Marvel universes converged a bit in 2012, when Hawkeye's comic costume was redesigned to look more like the film's version, and less like a scaly, purple Wolverine. There's a reason we never saw that old-school mask on the big screen, either in Avengers or X-Men: it's ridiculous. Both versions of Hawkeye are really good at shooting arrows, for whatever that's worth, and both are former agents of SHIELD. It's revealed that movie Hawkeye has maintained a secret family, while all comic book Hawkeye has maintained are romantic relationships with Black Widow and Mockingbird, a.k.a. Bobbi Morse. The latter appeared on Agents of SHIELD for awhile, but in a completely separate relationship, diverging the two universes once again. 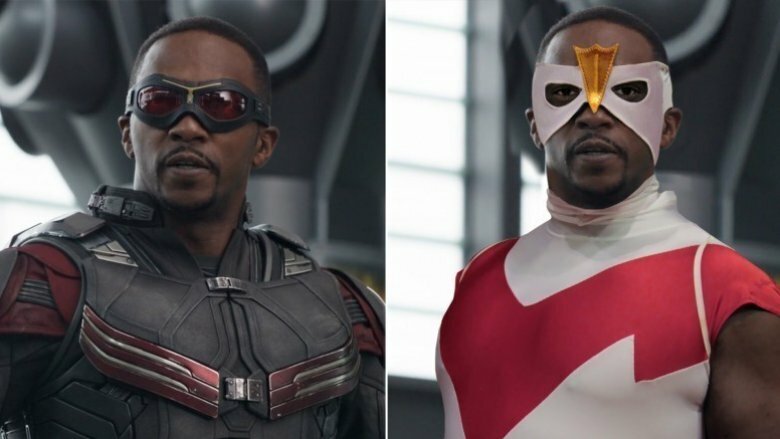 Equally unrecognizable is Falcon, who couldn't possibly be more different in the MCU than he is in the comics. It's an over-the-top superhero costume: red and white, with enormous red wings and a plunging neckline that leaves a whole lot of unprotected bare chest. Top it off with a real pet Falcon and you have comics at their most ridiculous. MCU Falcon is a guy in army clothes and a set of highly-advanced, technical wings. Goggles look a whole lot cooler than that white facemask anyhow. 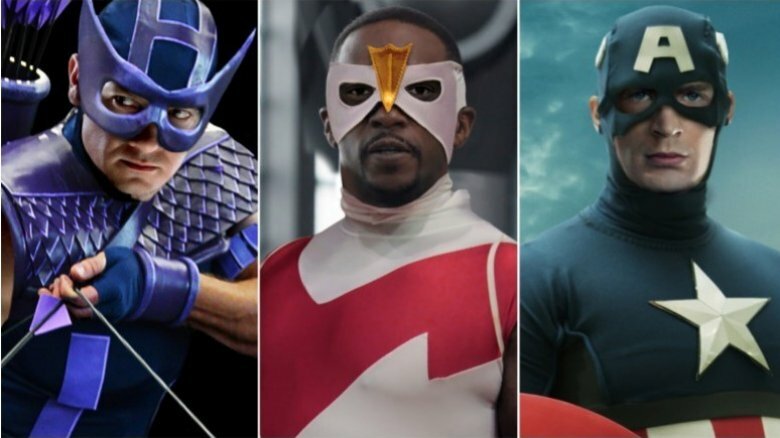 Falcon's comic history is surreal in ways that the MCU would never be able to handle. Rather than being a retired paratrooper, comic book Falcon is an ex-criminal who was mentally fused with a falcon by a cosmic-cube-wielding Red Skull…and like Aquaman on land, Falcon also has limited control over all birds, and can psychically see through their eyes. Try bringing that to the big screen without looking absolutely ridiculous. When Thor first appeared in 1962, he was decked out in the finest pseudo-Norse regalia, including the largest wings you've ever seen on a helmet, and kneepads that would make a goalie blush. Strangest of all, however, are the six weird discs that line the front of Thor's tunic, which are so iconic that they've stuck with Thor through many different costume changes, and even appear on his movie costume…even though no one's really sure what they do. 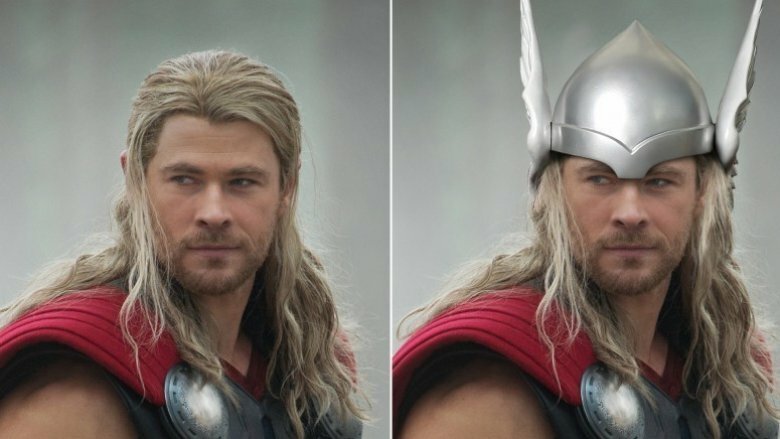 Movie Thor only occasionally dons the winged helmet, and has also opted for the armored arms of later Thors, since bare arms are so very yesterday. And that beard? Comics Thor generally prefers a clean shave. One big thing that the MCU ignores is the story of Donald Blake. Only comic book Thor was given amnesia and trapped in the body of a disabled med student for an entire decade before accidentally discovering his magic hammer again. As a doctor, Blake lived a double life with Thor and fell in love with nurse Jane Foster, which is obviously a far cry from the MCU's storm-chasing Jane. In fact, pick up a recent comic book and you may be surprised to discover that Jane Foster is Thor, because comics are complicated. With the Hulk already in play, the MCU just didn't want moviegoers to see another scrawny smart guy turn into a beefcake, so poor Don Blake was dropped completely. When the color of your costume is in your name, you can't really make too many wardrobe changes, but the MCU fabricated a far less revealing costume for their live-action Scarlet Witch. In the comics, she's in nothing but a low-cut bodysuit and a pointy headdress. Often enough, she's in far less. 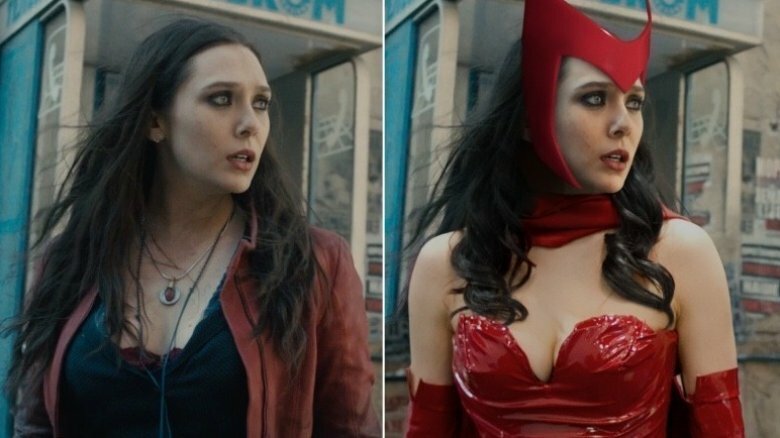 Fortunately for the MCU's MPAA rating, the on-screen costume of Scarlet Witch is more "autumn fashion collection" than "naughty magician's assistant." The MCU rewrite of siblings Scarlet Witch and Quicksilver is purely a product of studio squabbles, and not some genius Hollywood plot twist. In the comics, the pair were born mutants—until their origin was retconned to make them genetic experiments, which is somehow different from mutants in comic terms. In the MCU, the pair are HYDRA experiments. Comic book Scarlet Witch also has powers completely centered around cosmic "chaos magic," which has nothing to do with giving people mind-altering daymares. She can basically, and pretty inconsistently, change the probability of something happening. Good for Vegas, not always great at taking down an army of Ultrons. 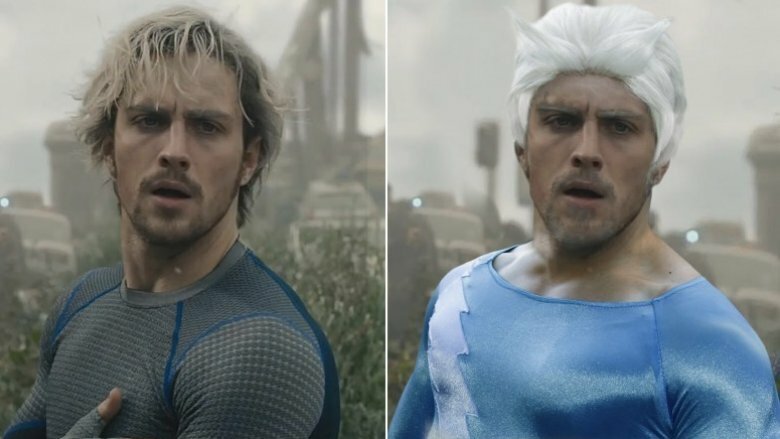 The MCU's Quicksilver shouldn't be confused with Fox's X-Men Quicksilver, who comes with more accurate, mutant-y origins. Comic book Quicksilver has worn a ton of different costumes, ranging from a green unitard with a lightning bolt theme, all the way to several blue unitards with…a lightning bolt theme. The MCU actually very cleverly and subtly incorporates the pattern into Quicksilver's athletic gear, but this is another instance where we're glad we don't get the full spandex package. Sure, Quicksilver is really, really fast; that's hard to screw up. He also started out his career as a bad guy, not unlike the MCU's version, before joining the Avengers. So, the movie's turn of events is really not that unusual, though comic book Quicksilver doesn't bite it on his first adventure. Instead, he goes on to marry an Inhuman woman and have a pretty full life. Let's not even talk about how Ultimate Universe Quicksilver had a romantic relationship with his own sister, because that's just creepy fanfic territory. In the pages of Marvel's comics, Vision is an android with a simple design: a bright red face, and a green and yellow costume. The whole thing is punctuated with a solar jewel at the tip of his widow's peak. Movie Vision is distinctly more robot-like, covered with patterns and unmistakably mechanical designs, as though someone wanted folks to be absolutely sure that this guy is a robot. The giant yellow comic book collar? Sadly missing. The MCU shoehorned Vision into their universe with his first appearance in Avengers: Age of Ultron only by changing a ton of tiny details. While both versions are brought to life by Ultron, comic book Ultron was created by Ant-Man, not Tony Stark, meaning Vision's whole family tree is a bit different. Tony Stark actually gets way too much credit, especially since in the comics, Ultron just used an old robot body that had been laying around since the Golden Age. 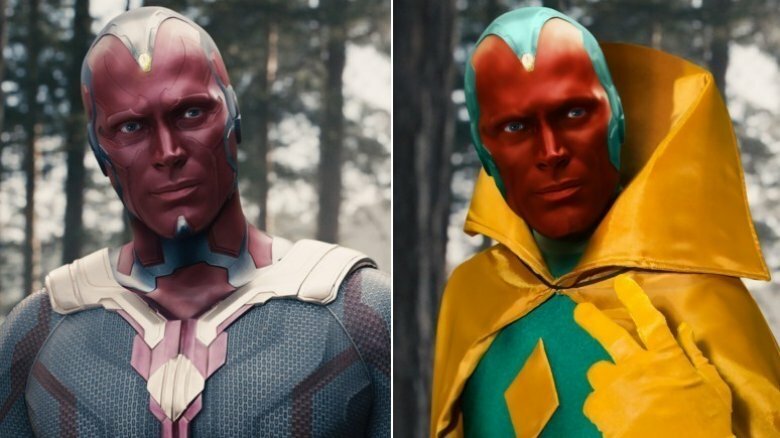 And while Vision's solar jewel is powerful, it's nothing like the Infinity Stone that his live-action counterpart wears. What remains unchanged, however, is Vision's romantic interest in Scarlet Witch. In the comics, they get married. In the MCU, the relationship is only beginning to bud. The best thing about MCU Captain America is that he's undeniably classic Cap, even though his costume constantly changes in subtle ways. 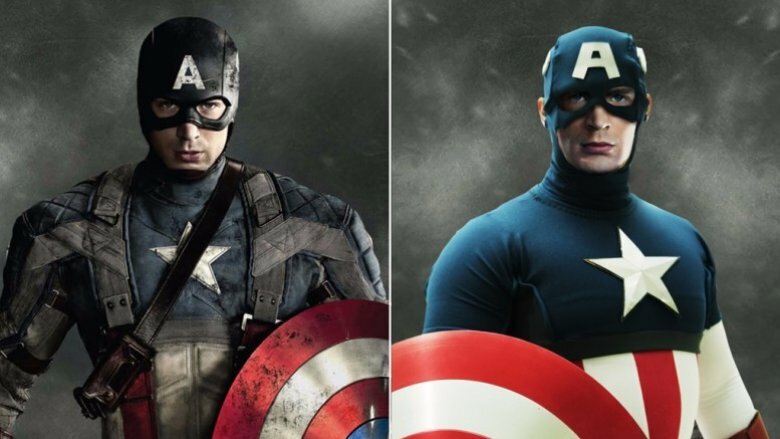 The most noticeable difference between first appearance Cap and today's Cap is the iconic shield. Originally, it was simply shield-shaped, before it evolved into the circular shield he uses today. Like most MCU costumes, Captain America is more tactical-looking that his comic origins, where he's often drawn wearing a scaly armor. Steve Rogers even simplified it for a while with a "Super Soldier" costume, dropping the flag-like stripes and adopting a new logo. And we've seen that look in the MCU, too. The MCU version of Captain America is almost completely true to the comics, which is what makes his film appearances especially delightful. Even Cap's initial bumbling around an army camp comes straight out of 1941, with a few tweaks. In the MCU, Cap is a patriotic mascot before he's taken seriously as a hero. In the comics, Cap goes undercover as a bumbling private who is sent on secret missions with the camp's mascot, Bucky, and a shield given to him by FDR. Comic book Cap has lost his powers, gained them back, died, come back to life, and even thought he was a HYDRA agent for a while. MCU Cap has a lot to look forward to. This costume change between the comics and the MCU is a fortunate one. During Ant-Man's early comic appearances, he was not immune to the spandex-and-underwear look, and his ant-controlling helmet was a huge, alien-like, silver dome. Solid for sci-fi, but rough stuff on the big screen. Fortunately, Paul Rudd's hero looks a lot more like he's wearing a high-powered fight suit. 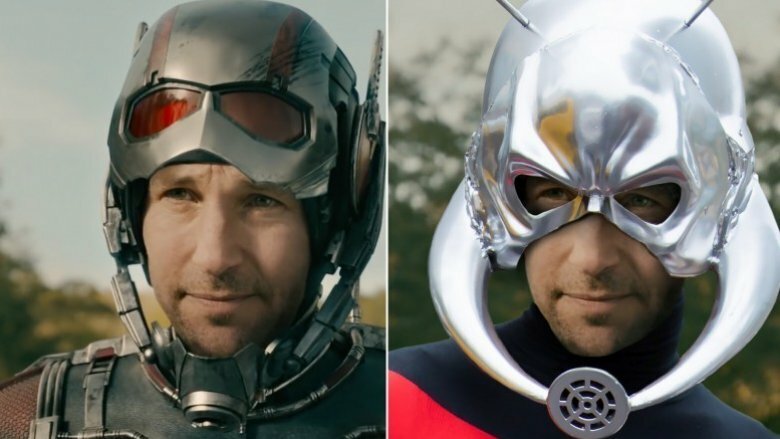 And while both helmets give off an ant-like appearance, the MCU version nails it. Since the MCU is already overflowing with genius heroes, Ant-Man doesn't get a lot of credit for being a tech wizard. Accurately, there's more than one Ant-Man in both the MCU and the comics. The original, Hank Pym, adventured in the suit with the original Avengers before giving it up, and Scott Lang later stole the suit from Pym to help his family, which should sound familiar. The movies kind of mix and match timelines, Ant-Men, and evil corporations…and spoiler alert, Scott Lang was kinda dead during Civil War anyhow, so any role he had in the film was just thrown in for star power. Sorry, bug dude. For the remainder of our feature, we're taking a look at characters whose onscreen looks don't differ substantially enough to warrant the full Photoshop treatment—but they still saw plenty of changes from the page to the screen. We'll start with the character otherwise known as 'gray Iron Man': War Machine, whose look has always been a variation on Tony Stark's unused or modified armor designs. 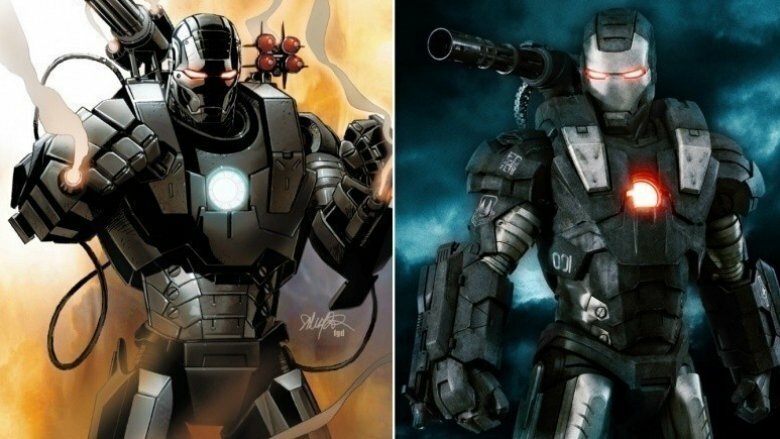 So if the universe has an Iron Man, War Machine is going to be his imperfect twin, probably decked out with more guns and a more serious color scheme. The MCU War Machine is straight out of the pages of the comics, but the later Iron Patriot armor is a different story. In Iron Man 3, Rhodey's armor is repainted simply to give the American people, now doubting the allegiance of super powered beings, a sense of comfort and trust. In the comics, the first time the Iron Patriot armor is worn is by Norman Osborn, better known as the Green Goblin, who has managed to take over HAMMER, which had previously replaced SHIELD. Osborn is, of course, a completely insane leader of the organization, though the armor did provide an extra layer of protection, both physically and from public scrutiny. How could anyone waving an American flag possibly be evil? Movie Hulk and comics Hulk are both big green rage monsters, but MCU Hulk took a few giant leaps over the Hulk's original appearance. When Bruce Banner first transformed into the half-naked giant, he was gray. Hulk took on a green hue before long, but occasionally regressed to his gray form, and vacillated wildly between smart and stupid depending on color and whatever writer wanted to leave their mark on Hulk at the time. MCU Hulk is simply "common green Hulk." Comic book Hulk became irradiated during an act of heroism, but movie Hulk turns into a monster because of a typical failed science experiment. 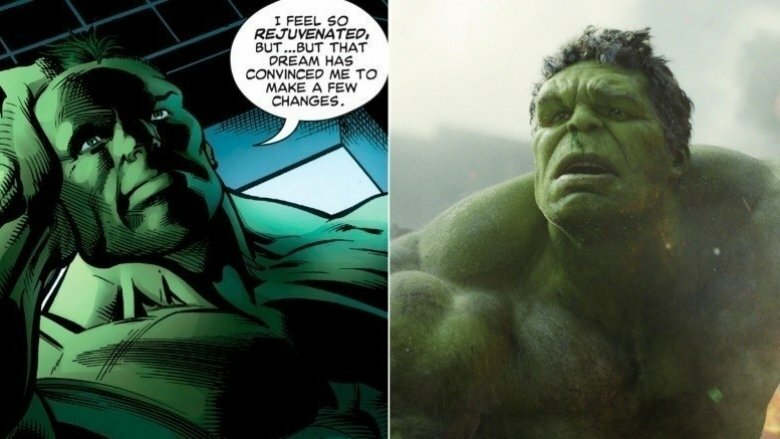 It took a few years for comics Hulk to slowly change from a semi-intelligent grey dude into an incoherent green dude, but Hulk's film transformation decided to omit Hulk's sad decline into madness and just start him out stupid. Hulk has been through a ton of changes, and in fact, the latest comic book Hulk is actually Amadeus Cho, a brilliant young scientist who seemingly managed to cure Banner completely. Movie fans probably aren't ready for a Hulk who can beat them at Jeopardy!, though. And that weird romance with Black Widow? Total movie junk from Avengers: Age of Ultron. The Wakandan prince's appearance hasn't changed much over the years. It's always been some variation on a black bodysuit. Once in a while, it gets a hole for the mouth and chin, and sometimes, it has a cape, a necklace of teeth, or gold accoutrements. 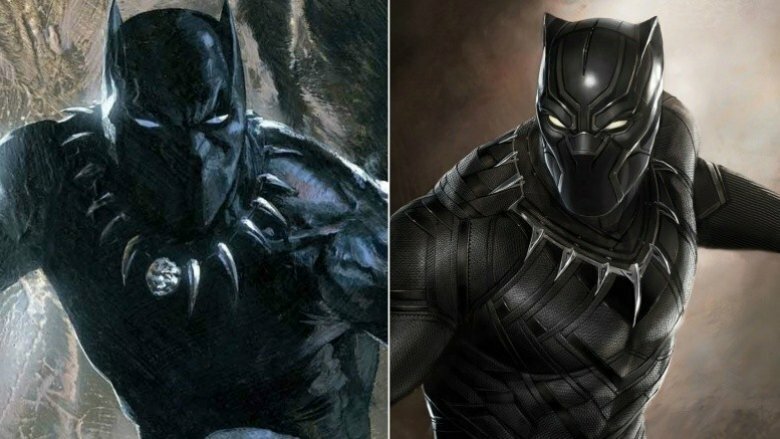 The MCU Panther is much of the same, but sporting a much more tech-looking suit, with patterns containing vibranium protection. Meanwhile, back in the comics, Pather generally keeps it more sleek and organic. Marvel comic science can build a device to instantly destroy the universe, but it could never check on the neighbors, so Wakanda wasn't known to the United States until it introduced itself by entrapping the Fantastic Four. By the time we meet Black Panther in the MCU, his country has already set up diplomatic relations with the rest of the world, and there's no sign of the tribal warfare that plagues Wakanda. Also omitted from Pather's origin story is the villainous Klaw, who kills Black Panther's father in an effort to steal the country's vibranium—though we did see Klaw pulling similarly shifty shenanigans in Age of Ultron. On screen, Black Panther's dad is killed by a boring explosion during a political event, caused by C-list villain Crossbones. And sadly, we'll never get to see Black Panther's marriage to the X-Men's Storm, because those movie universes just can't touch. We'll stick with the comics on this one. We've lost count of how many big-screen Spider-Men we've had, but this new guy is legit. Since making his appearance in Civil War, Spidey made fanboys and fangirls go crazy with just how comic-accurate his costume is. No raised webbing, no logos that look like they belong on an energy drink; just pure Spider-Man. Still, MCU Spidey seems to be wearing an unusual half-belt. What's that all about? While we had a good time seeing him bounce around in Spider-Man: Homecoming, sadly we didn't dive into the specifics of his belt-related fashion choices. Alas. 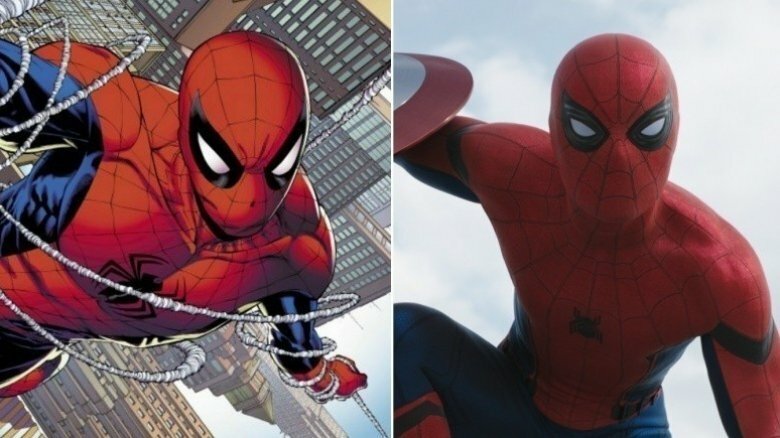 Like most other comic heroes, Spidey has worn roughly a million different costumes since his first appearance, but his current MCU costume is a totally fair average of the ol' red and blues. It's fair to say that the Marvel Cinematic Universe's version of Iron Man is pretty much on point. 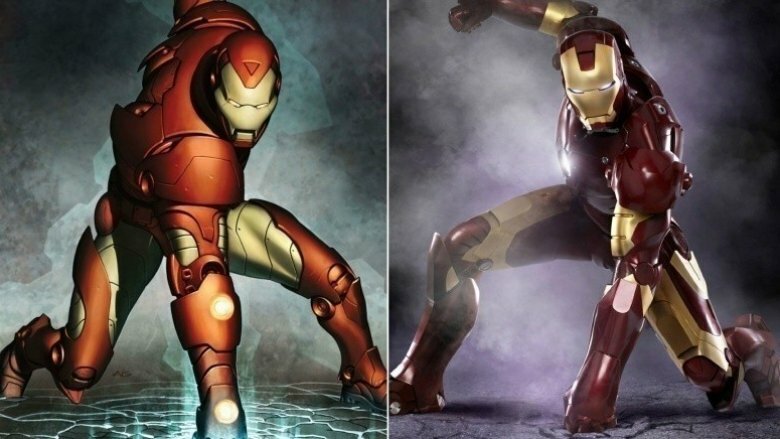 Even though Tony has changed armors more times than we can count, his film armors are a pretty accurate representation of how he looked in the comics through the 2000s. And under the armor? Robert Downey Jr. was born for the role. The MCU skips many decades of earlier, clunkier armors, but they landed on the perfect one for the big screen. Without Iron Man being true to the comics, the whole Marvel movie world never would have taken off. Still, the cocky billionaire you know from the movies is basically a caveman compared to comic book Tony Stark and the insane technology he's developed. Recently, comics Tony was flying around in his Extremis Mark XXXII armor, which is creepily and conveniently stored in his actual bones and connected to his nervous system. Kinda makes that armor suitcase in Iron Man 2 look like a pile of fancy trash. It remains to be seen if the MCU will deal with the comics' new "Iron Man," a super-genius 15-year-old girl named Riri Williams, or the publisher's upcoming plans to make Doctor Doom the "Infamous Iron Man." 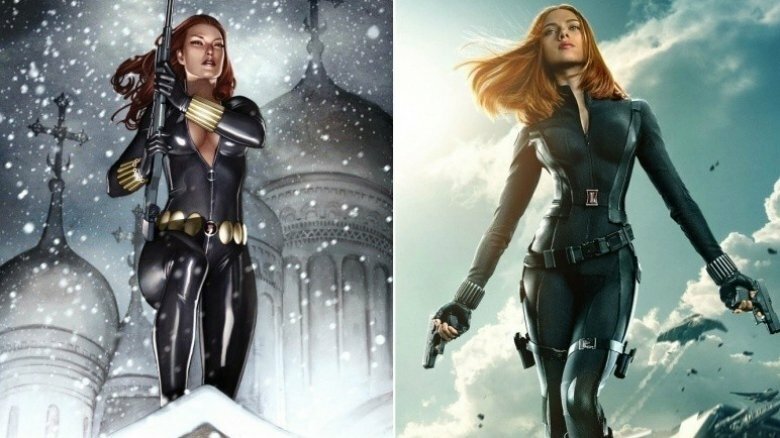 When it comes to the Black Widow's looks between the comics and the screen, there really aren't enough differences to mention. While her comic book outfit has changed subtly over the years, both versions share all the basics: red hair, black bodysuit, and wrist-mounted weapon thingies. In short, they're nearly identical in all the ways that matter. No comic fan's going to look at Scarlett Johansson in an Avengers movie and wonder when Mary Jane got all badass. Meanwhile, despite appearing in five different movies—starting with Iron Man 2, two Captain America movies, and both Avengers flicks–there's still plenty more we don't know about MCU Black Widow than what we do. Age of Ultron's Scarlet Witch-induced flashbacks clued us in to the Widow's history, how she was trained to be a spy and assassin from a young age by the Soviet government. She switched sides after Hawkeye spared her life and has been an agent of SHIELD and Avenger ever since. Her comic book counterpart has plenty of the same broad strokes, including her Soviet training and defection to the US of A. Pretty sure that Natasha's never been Tony Stark's assistant in the comics though. Funnily enough, Mary Jane has.